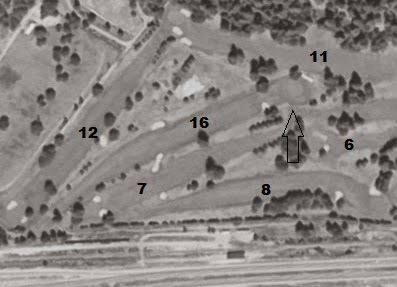 Here is a really neat aerial from 1957 showing the 16th hole (4th hole at that time). Notice the green complex back then had no trees around it, and the no bunkers. The bunker you see behind the green in this photo is actually the fairway bunker for #11. The original green complex on today's 16th hole was a classic example of a "punchbowl". What is a punchbowl? Well it is exactly what it sounds like. A "punchbowl" green is a putting surface that sits in a depression, so that the putting green appears as a "bowl" with a relatively flat bottom and sides rising up from that bottom. The bottom is the putting surface, the "sides" of the bowl typically consist of mounding around three sides of the putting surface. The front of a punchbowl green is open to the fairway to allow golf balls to run onto the green. The idea of a "punchbowl" is nothing new. In fact it is one of the oldest golf course design concepts so it's really no surprise to see it at Tacoma which is one of America's first 100 clubs and one of the oldest golf courses. Click HERE to read more about the origins of the "punchbowl". Unfortunately sometime after 1957, misguided tree plantings were made around Tacoma's punchbowl green. Even worse, roughs were allowed to encroach on the green so the opportunity to run the ball along the ground was taken away. 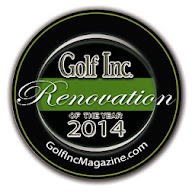 Above you see what #16 green looked like in 2011 before we started any renovations. In 2012, Mother Nature helped us out by killing some of the trees behind the green in a freakish wind event. Then we started renovations and began mowing the course with less roughs and more short grass around all the greens. Now today in 2015 we have decided to further restore the punchbowl and this is the story of what we did. First we dismantled the last remaining flowering cherry tree from behind the green. Ornamental trees like this are so inappropriate on a golf course, especially 10 feet from a putting surface like this one was planted. Its shallow root system was undermining the green and the roots themselves were along the surface making it dangerous for anyone to strike a golf ball in that area. Anyway we removed the tree and all of its root system. Then we brought in some new trees. Now these are not ordinary trees. We brought in endangered Garry Oak trees as part of our oak savanna preservation plan. This is a historic moment because for the first time we are actually taking steps to replace some of the treasured oak trees that have been lost over the past century. These trees came from a nursery that has made a serious commitment to preserve the Garry oak. The folks at this nursery seek out oak trees that are scheduled for destruction and then move them to their preserve where they can be cared for while a new owner is found. Thankfully, we found these people and have formed a friendship. We now have a great resource for future plantings of native oaks in order to preserve and protect the oak savanna here at Tacoma C&GC. The trees we brought in were not small. Each one weighed close to a ton. I needed help getting them from the parking lot to the site behind the 16th green and my friend Micah had the perfect machine. His skid steer has smooth tracks that allow him to carry heavy loads right across fairways leaving little to no damage. It took Micah only about an hour to carry the trees out to the 16th green which will be their new home for the next several hundred years. Positioning them was more difficult than I thought it would be, but of course I have the most amazing staff and they got it done in typical, brilliant fashion. The oak trees should be very happy here since they will be in full sun which is what they like. 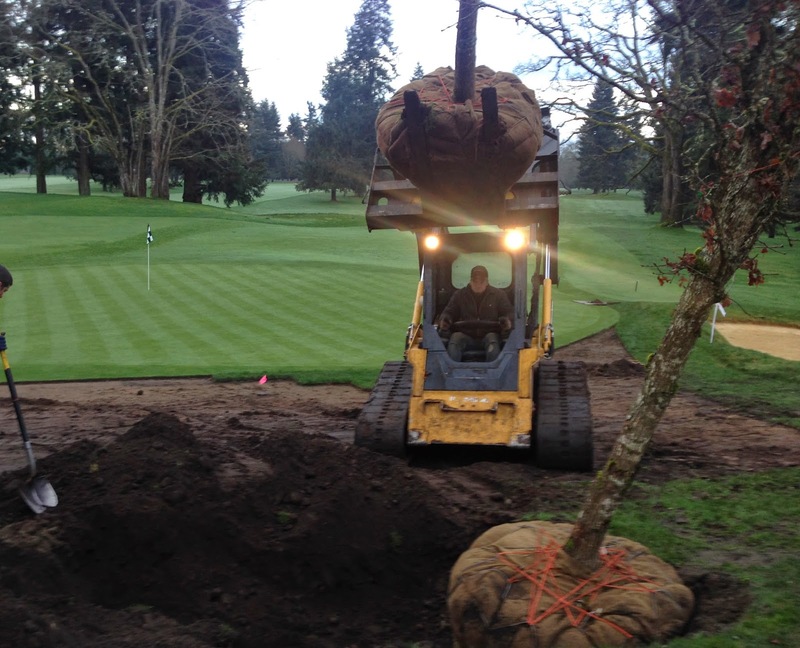 If you're going to have trees on your golf course, a Garry oak would be a good choice. Since they're deciduous, light and air passes through them in the winter allowing for good turf conditions in surrounding areas. In addition, they do not have surface roots or even shallow roots. You can grow grass right up to the base of them and play a golf shot from around them without fear of breaking your club or wrist. Once the trees where planted, sand was brought in and used to grade the slope so that it was smooth and ready for sod. Today we are now mowing this area at fairway height and the punchbowl is almost fully restored. In order to fully restore the punchbowl we would have to remove the bunker and take short grass all around the left side of the green. I'm sure that would be really neat, but right now we do not have that as part of the plan. I'll never forget the morning in May 2012 when we started our bunker renovation. This bunker on 16 was where we decided to start so it was going to be our first attempt at building fescue bullnosed bunkers. John Harbottle III got to the site before me since this bunker was only a few hundred feet from his house. He called me on his cell from this spot at 16 green and said "Joel, I'm thinking we should just remove this bunker since it's only been here since 1989." When I got out to the site we discussed it together. John knew that it should be removed but eventually we decided to just build it. If the bunker project would have ended here I think things would have turned out different. No doubt we will be discussing the merits of this bunker over the next couple of seasons and who knows, maybe it will go and the punchbowl green will be fully restored. For now, the bunker John built here is really cool and the newly restored slope behind the green is very cool. The introduction of 5 new endangered oak trees is honestly one of the most exciting things I've ever done. The 16th hole at Tacoma is arguably one of the best holes on the course and now it is even so much better. I can't wait to hear the stories of shots played on and around the restored slope.